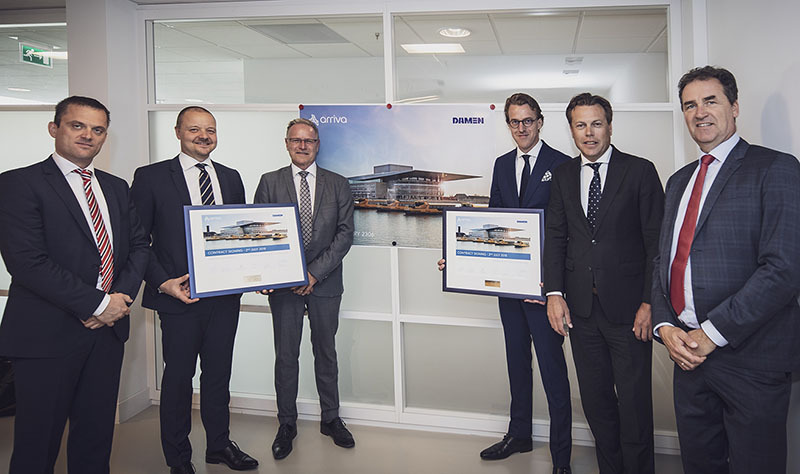 Damen Shipyards Group signed a contract with multinational public transport company Arriva Danmark for five fully-electric ferries, known as the Damen Ferry 2306 E3. Damen E3 vessels are designed with the philosophy of being environmentally friendly, efficient in operation and economically viable. Johan Spiegelenberg (Category Manager Bus), Jens Boe Jacobsen (Business Development Director), Torben Hansen (Director Bus of Arriva Danmark), Martin Verstraaten (Sales Manager North, West and South EU, Damen), Arnout Damen (Chief Commercial Officer, Damen), Frank de Lange (Sales Director North, West and South EU, Damen).